When you’re getting started on a build or remodeling project, sometimes it can be hard to see the potential in your present space. What would it look like to build something entirely new from either an existing outdated space or a blank, empty lot? Looking at before and after pictures from the homeowners who have been there, remodeled that can be a helpful step in visualizing what your own dream space could look like. Here are seven outstanding bathroom remodels that show you how homeowners made their homes their own. Home decor blogger Ashley took a simple, plain black-and-white color schemed space and completely transformed it with bright floral wallpaper. 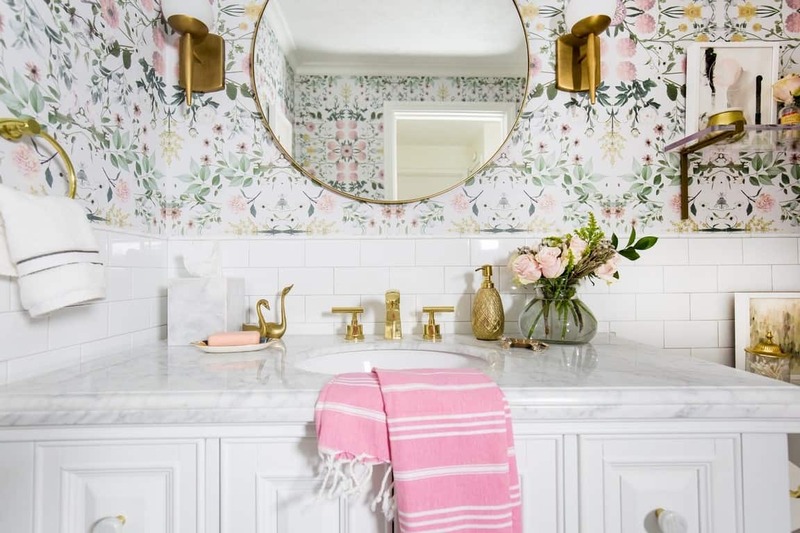 Using the colors in the wallpaper as her starting palette, she chose faucets, countertops, light fixtures and other decor touches that harmonized with the theme. The result is a bright and welcoming space. Neutral colors don’t have to be boring — a truth that Victoria Smith proved when she blogged her remodel on SF Girl. With an intentional choice to ground the space in black tiles and lower cabinets and then brighten it up with white walls, shower, bath and sink, the result is classic and modern, taking advantage of the room’s large picture window. When it comes to anything kitchen or bathroom related, it’s hard to go wrong with incorporating marble. That’s exactly what Emma, one half of the founding team behind lifestyle blog A Beautiful Mess, did when remodeling her home bathroom. Using marble for the counter, floor and shower wall transformed a fairly unremarkable space into something eye catching. She also incorporated some subtle but warm colors with a rug, effectively visually breaking up the marble. This beautiful bathroom remodel by stylist Emily Henderson uses its fair share of clean cut white, but grounds itself in jewel tones for visual interest. A subtle neutral wallpaper for the top half of the room gives way to rich blue paneling for the lower half. The finishing touch comes with a tufted, patterned rug that serves as the room’s centerpiece. 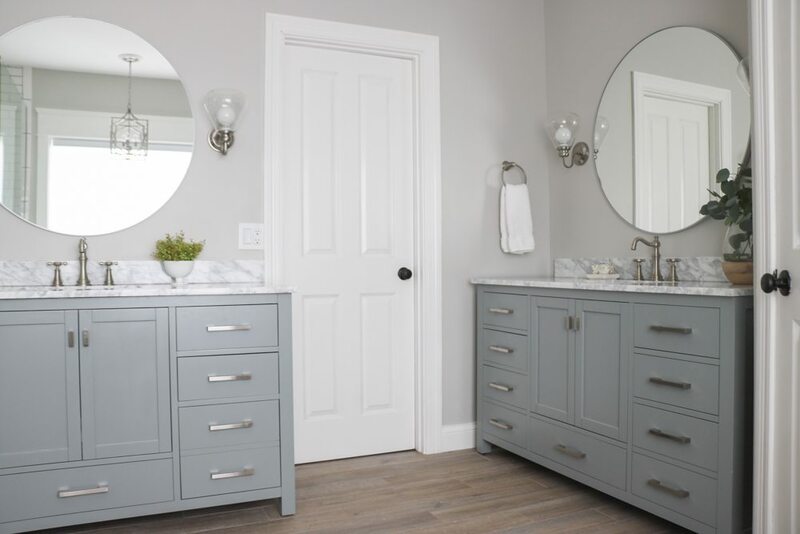 Home decorator Sara D played on multiple different gray tones for her bathroom overhaul. A space dominated by outdated wood finish cabinets transformed with the clean lines of new gray cabinets with marble tops. Round mirrors present a minimalist yet quirky personality. Sara chose a more natural light toned wood flooring to ground the space. 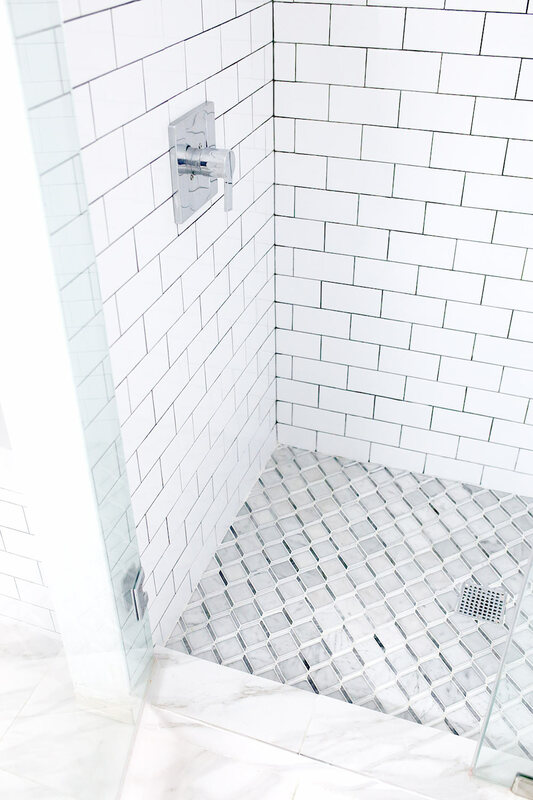 Blogger Cameron Proffitt paid special attention to the details within her minimalist palette to transform her bathroom. 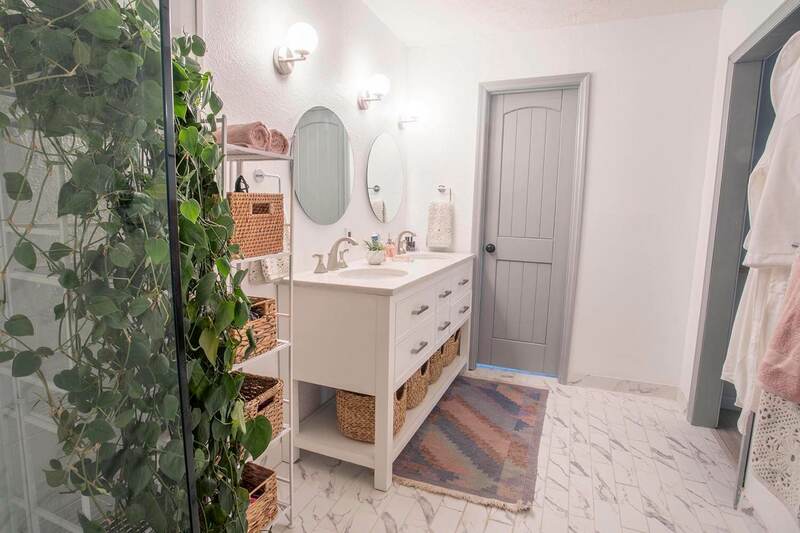 With clean white subway tile walls as the starting place, she chose a more detailed geometric tile for the floor in the shower, stuck to slick modern silver fixtures for her sink and bath and added floating shelves for minimalist storage. This quirky remodel by Chris and Julia goes beyond the box of just one color or pattern. With marble tile, a black and white floral wallpaper accent wall, and sea teal shower tile, the room is visually sectioned off in different areas to explore. Are you ready to move beyond brainstorming and into action? Contact WalGrove today to get started!